And let's not forget the Coconut Lounge. Thai Bamboo has been around for a long time, probably since Spokane was known as "Spokane Falls". There are now four locations around town, this one being their new "flagship" spot. It's a gaudy spot at that, though sort of in a fun way. Fake bamboo all around, fake palm trees... Porch seating with a scenic view of Division St.
That aside, the food is what one would call inconsistent, and definitely not in a fun way. The Gaen Gai curry, for example, was good. Nicely cooked chicken in a sauce that was spicy for being three-star, and definitely a dish worth trying. On the flipside was the Pad Thai. It wasn't even luke warm with the tofu being soggy and cold, like it had been sitting out for a good half an hour. This one was also supposed to be three-star, but had absolutely no kick to it. I'm not sure if they forgot to add spices or not, but the dish was overall highly disappointing. In fact, it's always a major letdown when a signature dish is so far off from what you expect. Bonus point, though, for using a lot of local ingredients. That's more than many places do. Overall our visit to Thai Bamboo was a mixed experience. The Thai Tea was good, as was the curry. It is hard to get past the Pad Thai, however, and the location doesn't exactly scream high-class. 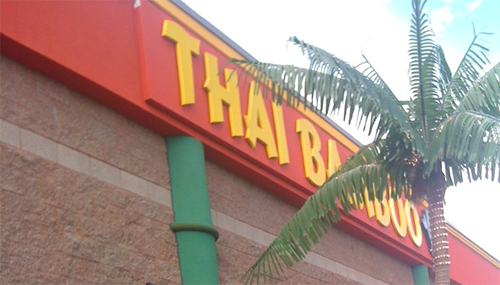 We'd go back, but Thai Bamboo is not near the top of our list. Do you recommend Thai Bamboo Restaurant? Make your voice heard!